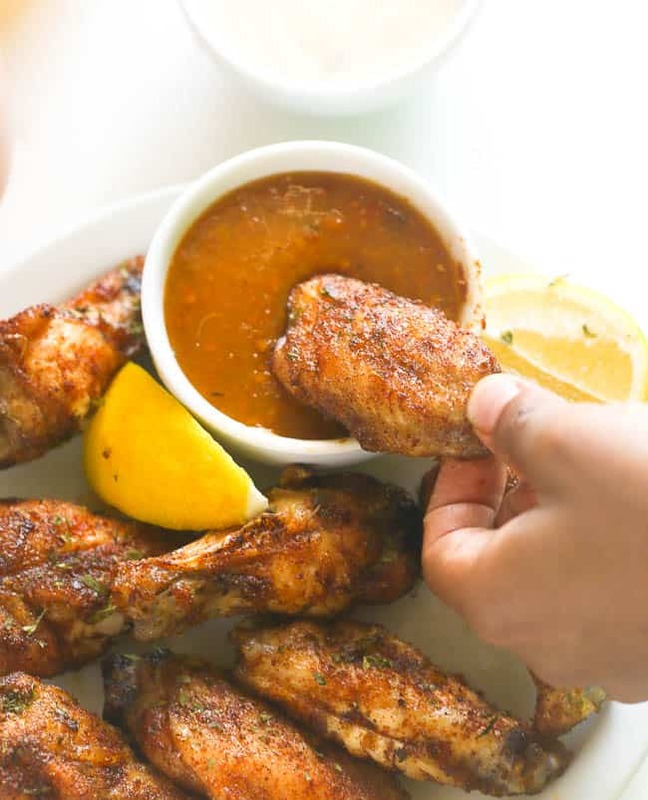 Baked Jerk Chicken Wings- Baked to crispy perfection with all the bold flavors of Jerk Spice rub- 10 minutes prep is all you need!!! This is going to be the easiest recipe with this Jamaican Jerk Spice blend here, that am going to share with you. After my spice blend mixture was complete, I just had to put it to the taste test. What better protein to test it on than chicken wings. What requires minimal prep and is a great crowd pleaser too? Chicken wings- of course! If you can’t decide what to make for your next gathering just wing it. 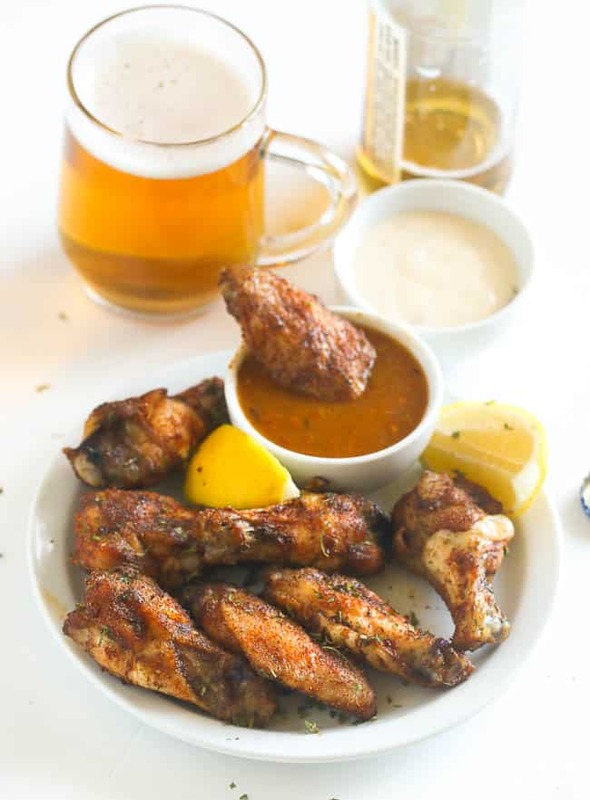 These chicken wings would sure to be a hit at your next party, game day or anytime. You just knew this was coming right? To tell you the truth, I have become somewhat complacent when it comes to chicken these days. All I do is sprinkle jerk seasoning on any cut of chicken that is available and go on with my usual business. 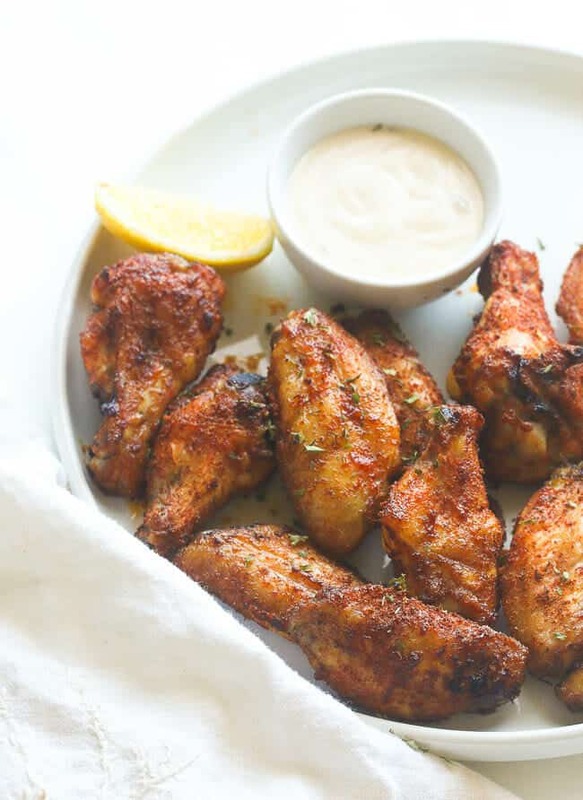 No complains so far, I even made some of this jerk wings to take to the beach and it was a hit with everyone, even those with discerning palates (kids). I know kids go crazy over anything wings, as long as they have dipping sauce to go with it. I completely forget about the kids and brought along pepper sauce instead. No one asked for a dipping sauce, which was a great relief. If you love this chicken wings . You are going to go crazy for these ones right HERE they are grilled and smothered in hot and sweet sauce. Finger lickin’ Good. Line a baking pan with foil; top with a wire rack. Arrange chicken wings out in a single layer. 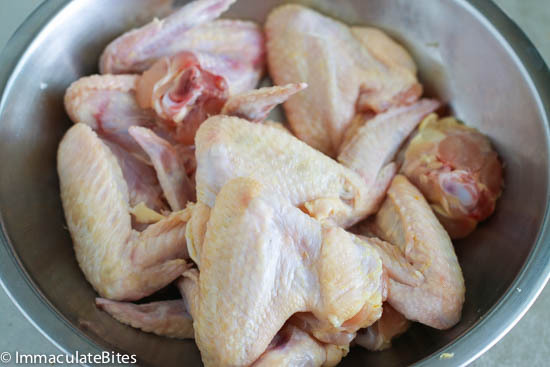 While the chicken wings are baking oil will slowly drip to the bottom of the baking pan. Yes! I’m wondering the same. What is that white dipping sauce depicted?.. It’s good old ranch! It works well with this too! TURNED OUT SOOOO GOOD! SIMPLE AND EASY. TGE RACK ALLOWS THE CHICKEN TO COOK AS IF IT WAS ON AN ACTUAL GRILL! THANK YOU SO MUCH! Hey, if I do not have the rack, what alternative can I use? Hi Shawna! You can just bake it in a large roasting/baking pan. Thank you so much Vanessa! So glad you are here . Do let me know which ones you try out . 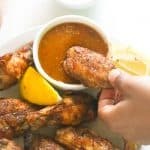 What’s the recipe for the chicken wing sauce? I used hot sauce and caribbean pepper sauce. Don’t wash your chicken! All you will do is scatter the bugs from the raw bird all over yourself and the kitchen! The heat of the oven will kill any bugs both inside and on the skin of the meat. My experience in the past of jerk dishes, both at home and in the Caribbean, is that they’re usually made with a liquid marinade, but there’s no reason why one shouldn’t use the dry rub approach. The jury is still out on this one for me. I always wash my chicken. Try to do it as careful as possible. I know all the experts tell you not too. To each it’s own. Thanks for taking the time to share this with us. 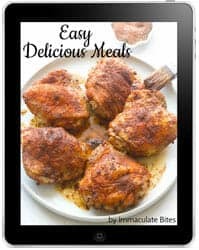 Your recipes sounds scrumptious and the pictures look great. First time on your site and I will be trying several. Many thanks for sharing. What type of red sauce is picture with the wings. My pleasure! Glad you are here Sandra. These look absolutely divine! 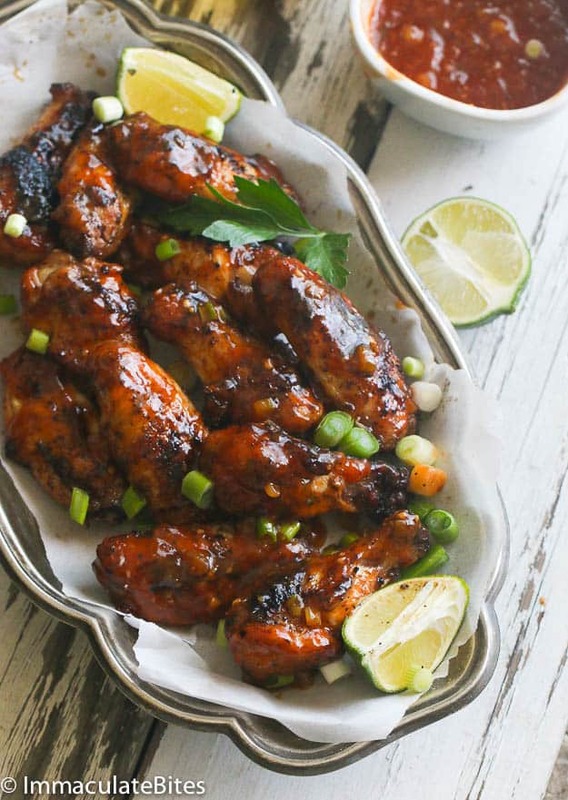 I am heading to the Caribbean at the end of this month and these are the perfect wings to get me ready. I see that you use coconut sugar in your seasoning blend.. I have never heard of that before .. I look forward to trying it 🙂 Thanks for a great recipe! They sure are, you can use coconut sugar or brown sugar. Coconut sugar makes it paleo and it tastes quite good too! Have a save trip ,and you get my permission to try everything . I just stumbled across your blog while looking for meat pie recipes. 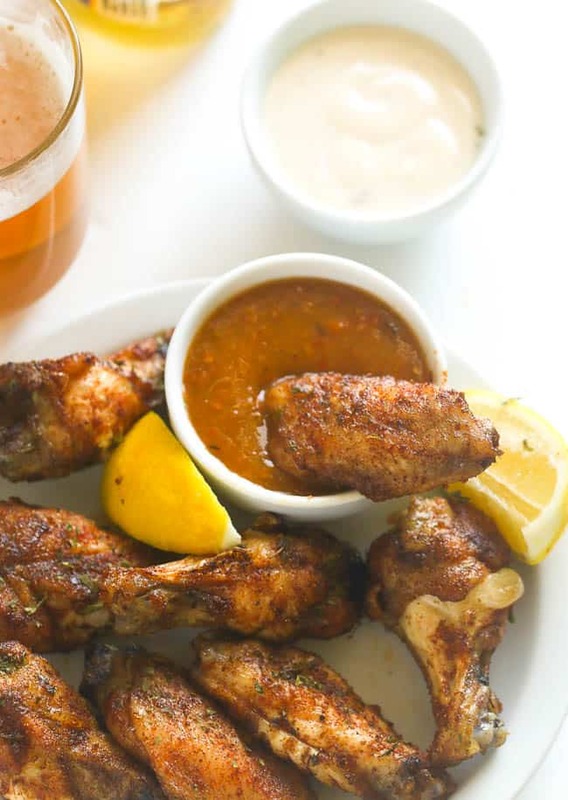 I have found a dozen recipes I’m anxious to try, including these jerk chicken wings! Thanks so much and congratulations on the wonderful recipes! Thanks Chris- so glad you found my blog, I can’t wait for feedback on the ones you try! Thanks for sharing this! The chicken looks so crispy and you have great combinations of flavors. The seasonings are just wonderful! I tried the recipe (with a few modifications) and it turned out great! 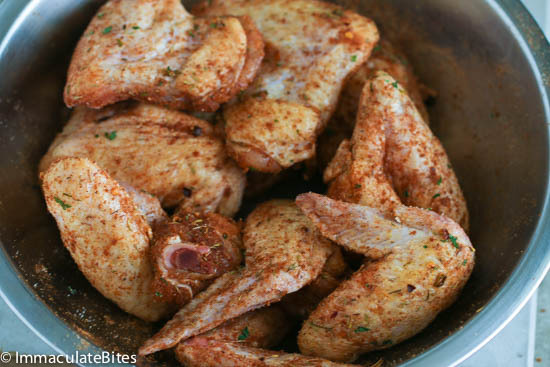 I made the jerk spice but also used blended spices (onions, parsley, bell peppers, ginger, garlic) to spice the wings. I also let them marinate overnight. The jerk seasoning is AMAZING! I will definitely make it again but will probably omit the sugar. 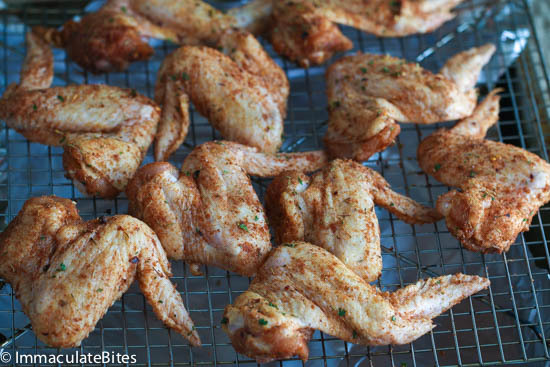 Next time, I will try to grill the wings with the jerk spice! Hi Cassandra! Thanks for the feedback and your modifications sure sounds tasty! Thanks For the Feedback Tiana. Am glad , you are a fan of Jerk Chicken. Here is the link to it https://www.africanbites.com/jamaican-jerk-seasoning-recipe/. 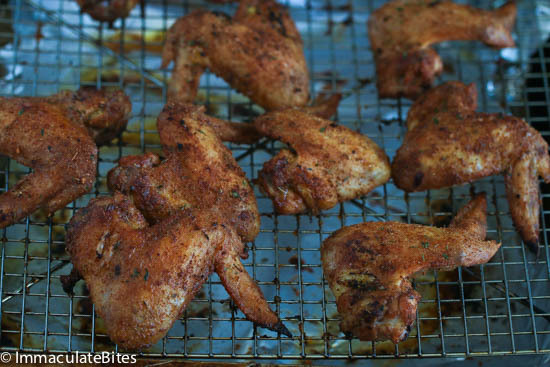 How do you make the jerk season for the jerk wings?